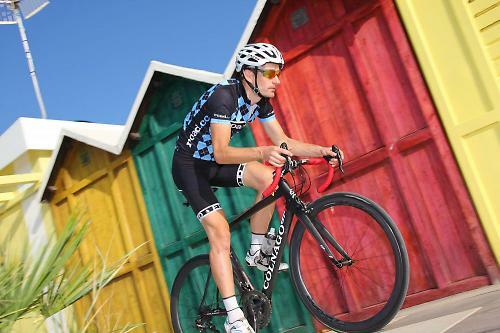 Colnago have been busy this year, first launching the latest C60 and then, in time for the Tour de France, the V1-r. This bike is a bit of a departure from everything that has come before from the Italian company, as it's been shaped in the wind tunnel. Yes, it's their first aero road bike. Most manufacturers want or need an aero bike in their range these days, especially one sponsoring a World Tour team as Colnago does. The V1-r replaces the previous M10, Colnago's go-to race bike and make no mistake, the V1-r is a thoroughbred race bike. It was ridden by some members of the Europcar team at the Tour, including sprinter Bryan Coquard. While the C60 is itself no slouch, it feels more like a grand tourer compared to the sharpness and effervescent speed of the V1-r. It begs to be ridden fast. That can be said of most top-end race bikes of course, but the V1-r feels really comfortable and settled at high speed compared to some bikes that can become a little twitchy and edgy. The V1-r has a wonderful balance and composure and can sometimes fool you into thinking you're not going that quickly when in fact you're travelling pretty damn fast along the road. I spent a week testing the V1-r on our recent trip to Italy and spend a lot of time exploring the area's wonderful corners, curves and bends. Throwing the V1-r into them reveals a real triumph in the geometry, the handling and the stiffness of the frame and fork. Some bikes have to be muscled through the bends, the V1-r simply arcs through with no drama or fuss. That balanced handling and steering makes it alarmingly easy to push closer to the limits, but it just feels comfortable and calm in such situations. Where it doesn't feel quite so calm is on rough roads, and there were plenty of those in Italy. Thankfully the V1-r was shipped to us with 25mm tyres. With them inflated to about 90psi, the V1-r still relays a lot of the road surface through the contact points. It's not an uncomfortable bike as such, but you have to accept the ride is going to give a few jarring thumps. It whips up to speed with impressive ease. The claimed 835g frame weight and the no-expense-spared Campagnolo Record and Vision Metron 40 wheels brought it in under 7kg, which no doubt played its part in the feel. It doesn't have the electrifying acceleration of some race bikes like the Canyon Ultimate CF SLX or Alchemy Helios but it's no slouch. It just doesn't have the same startling pick up from lower speeds as those two bikes. It makes up for that initial lack of fizz with impressive ease of handling in high speed situations; once it's going very fast it handles better than those two. Clearly it's a bike happiest at speed. This is Colnago's first aero road bike and it displays all the usual hallmarks of a road bike designed to carve efficiently through the air. Colnago have used NACA airfoils (airfoil shapes for aeroplane wings developed by the National Advisory Committee for Aeronautics), with a truncated shape, much like the Kamm Tail profile that is used by quite a few bicycle manufacturers. They've used this profile of all the main tubes, and the fork blades are all-new too. There's a new seat post which is 27.2mm in diameter but has the same D-shape profile as the seat tube. There's no integrated seat clamp, just a regular external clamp with the bolt behind the post. I had problems with the seatpost slipping on the first ride out, but some carbon paste soon remedied that. The seatpost, Colnago's own design, uses a single bolt to clamp the saddle in place and is easy to use and adjust. Colnago don't offer any aero data to show how much the frame reduces drag and without a wind tunnel to test the frame ourselves, it's impossible to validate just how aero this aero frame is. It looks aero for sure, but how it compares to the Giant Propel, Scott Foil, Cervelo S5 or Specialized Venge is something that would extremely interesting to know. Releasing an aero product without any aero data is a bit silly really. 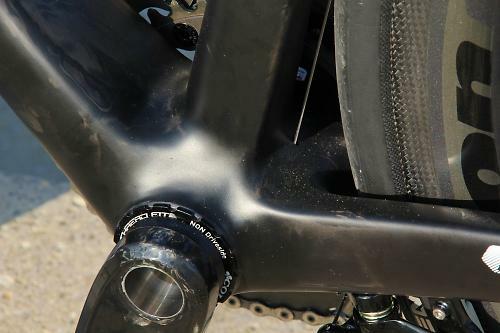 The down tube is massive and it flares hugely as it approaches the bottom bracket and here we find the ThreadFit system first seen on the C60. This uses replaceable sleeves that thread into the bottom bracket shell and accepts any current bottom bracket. It was developed was to try and eliminate the problems of creaking that can occur on press-fit bottom brackets. Colnago have used the extra width of the wider bottom bracket to oversize the down tube, seat tube and chainstays. As a result, the V1-r doesn't lack any stiffness. The other really big departure for Colnago is to adopt the current trend for direct mount brakes, and to locate the rear brake under the chainstays. 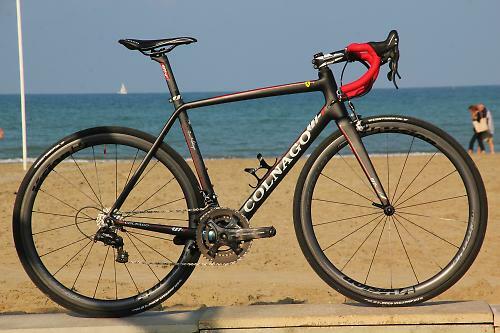 Colnago aren't alone, many manufacturers are doing the same with their latest bikes. Is it an improvement? That depends. It probably reduces drag and does provide a pair of clean and uncluttered seatstays, but adjusting the brake isn't as easy; you either have to stick the bike in a stand or turn it upside down. Not good. Windwave, Colnago’s UK distributor, sell the frameset without brakes so it’s down to you to spec the brakes. There is some choice at the moment, and the bike was orginally supplied for review with TRP units. Their performance was lacklustre and disappointing, and took the shine of an otherwise stellar bike. Hearing our complaints, Windwave took the bike away and replaced the brakes with Colnago’s own brakes, which weren’t available at the time of the test. The difference was massive. Instead of the previously underpowered and inconsistent braking feel with the TRP brakes, the Colnago items were much more powerful, with a lever feel immeasurably better. You can only buy the V1-r as a frameset so to allow us to conduct a test, Colnago distributor Windwave kindly supplied a fully built bike. They spared no expense with the parts, slapping on a brand new Campagnolo Record 11-speed mechanical groupset along with Vision's excellent Metro 40 carbon clincher wheels with Continental Grand Prix 4000 S tyres. The frameset costs £2,999.95 but you're looking at something in the region of £7-8k for a build like this. That's a bucketload of money, but look at it, what a stunning bike. It's head-turner, even on hometurf. This is the first time I've ridden the new Campagnolo groupset and the main thing to note is that it feels almost identical to the previous version of Record, but there are some subtle differences in the shifting performance. 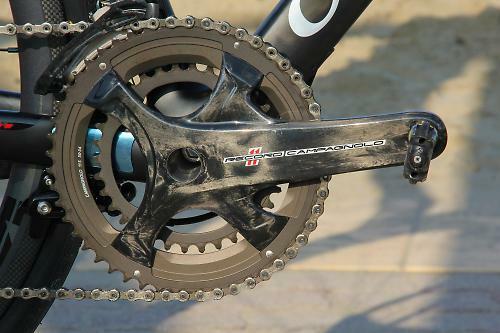 It's a little more direct and clean in the way the chain moves from one sprocket to the next. The chainset is also brand new with 4-arm spider and only one bolt-circle diameter option that will accept 53/39, 52/36 or 50/34 rings. As for the claimed stiffness increase with the new design chainset, without riding a previous generation chainset alongside it, it's tricky to say with any certainty that the stiffness increase can be detected. It didn't want for stiffness though when I was climbing out of the saddle or sprinting against our Italian tour guide. 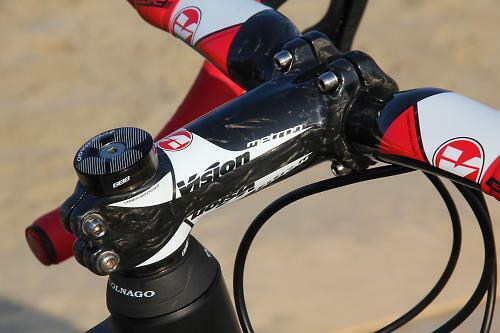 This was also my first time with Vision's Metron carbon stem and matching Metron 4D carbon handlebar. 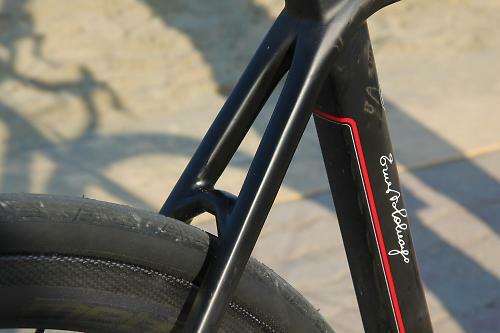 The bar has what Vision calls an 'Aero-Ergo' central section, with a rise from the stem clamp and a 10 degree forward bend. It looks odd, but is surprisingly comfortable whether in the drops or on the hoods. The bars flare out at the hoods and effectively push them further out in front of the bike extending the reach. 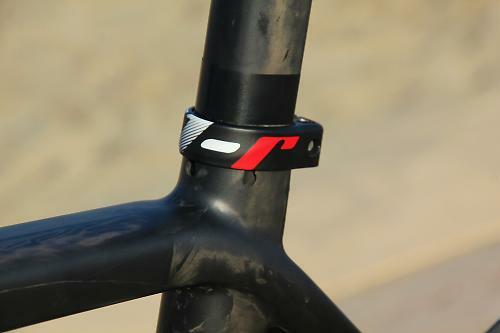 The stem is the same as the FSA K-Force stem I reviewed earlier this year. 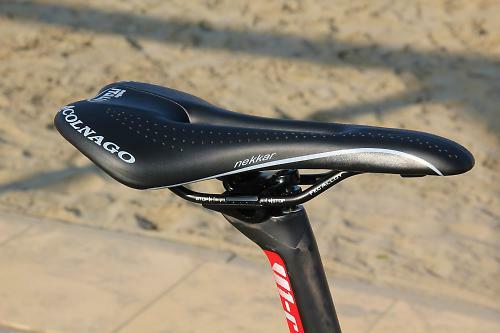 The Colnago branded Selle Italia Nekkar saddle was comfortable despite never having used it before with the central cutout reducing designed to reduce pressure on your precious bits. All that kit produced a complete weight of 6.95kg (15.32lb). The V1-r is a fantastically quick and composed bike that ravages twisty mountain roads and rails through open sweeping bends. It doesn't have the same electrifying turn of speed of some other top-end race bikes, but there is a great appeal in the way the V1-r holds onto speed and feels balanced and stable when you push up against the limits. It's this handling performance that really stands the V1-r out from the competition. Caution needs to be taken when speccing brakes. My experience with direct-mount brakes so far has been a bit hot and cold. The TRP brakes first fitted to the test bike were appalling, but thankfully the Colnago branded brakes were a dramatic improvement. Choose carefully and you'll be fine. Hopefully there'll be more direct-mount brake caliper choice soon, becuase there needs to be if it's to be a standard that is going to stick around. Oh, all those words and I haven't mentioned the aesthetics. Looks are a subjective matter of course, but over in Italy the locals were all over the V1-r and that Ferrari sticker received nothing but thumbs up approvals. It's undeniably a handsome looking bike and very modern compared to some of the more traditional-looking bikes that have come out of Colnago in past years. For what it's worth, I think it's one of the better looking bikes in its class. Update: This review was amended since first published following the change of brake calipers to the supplied test bike. The V1-r is the new frame from Colnago designed for cyclists who are particular about their bike's weight-to-performance ratio. It is made with the highest quality carbon fiber, selected in cooperation with Ferrari, which is why is we use the Cavallino logo on each frame. The frame is monocoque, with aerodynamic shaped tube sections, and full-carbon rear dropouts. The V1-r is the best monocoque frame produced in Colnago's sixty year history. All of the V1-R's tubes, including the fork blades and the seat stays, have a special shape optimized in the wind tunnel to make the V1 even faster. The V1-R's fork is also a new concept, designed and structured to support the integrated front brake body. One of the most striking features of the V1-R is the adoption of a new standard for the braking system. Another major innovation found on the V1-R is represented by the use of carbon fiber monocoque dropouts and an internal replaceable derailleur hanger. 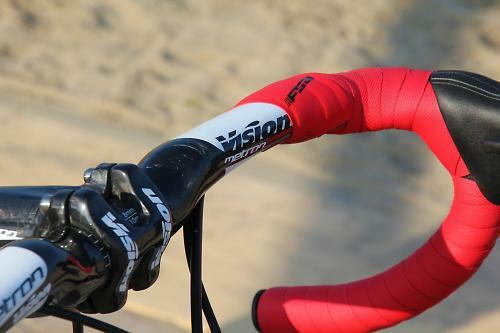 For the maximum integration and aerodynamics, we offer the new V1-R with a special, dedicated seatpost. To increase the rigidity of this portion of the frame, without increasing the thickness of the tube walls and, consequently, frame weight, the V1-r uses tubes with larger sections. Fantastic build quality with carbon rear dropouts but aluminium fork dropouts to improve durability - it is a race bike and needs to withstand being put on car roof racks. Noticeably sharper and more responsive than the C60 but has some similarity in high speed balance. The 52 sloping was the perfect fit, I just needed to fit a longer stem. It's not the most comfortable bike to ride and the frame stiffness does relay a fair few impacts and judders to your hands and bum, but in terms of fit it was comfortable. Oh yes, you can feel the stiffness when you lean the bike over into corners, and it's stiff when pedalling hard or sprinting. Really nice handling, docile at lower speeds but comes alive at higher speeds. Yet at high speed it feels easy to ride and isn't at all twitchy. Did you enjoy riding the bike? Yes a lot. Would you consider buying the bike? Without trying other direct mount brakes first, probably not. Would you recommend the bike to a friend? With these brakes it's hard to recommend. Brakes aside, the V1-r was a lot of fun to ride and provides great speed, handling, balance and responsiveness compared to the C60. Forgive me if I'm missing something here, but if it's only available as a frameset why is it being marked down on braking capabilities? 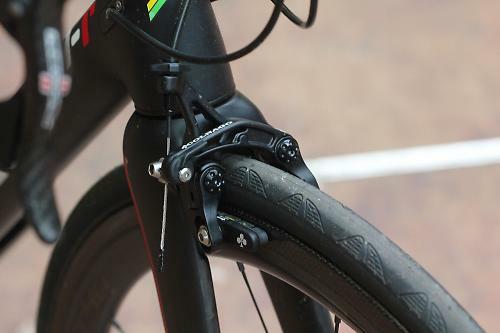 I've yet to ride a bike with direct mount brakes and come away thinking it's an improvement on the latest generation of dual pivot brake calipers. 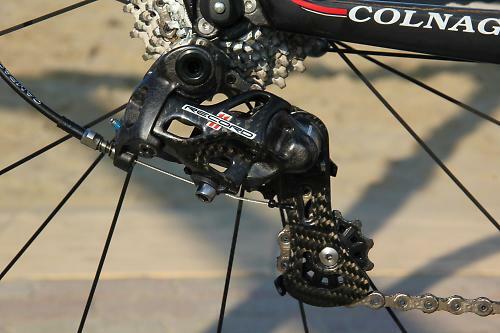 Worse still, direct mount is a Shimano standard and as yet Campagnolo don't offer a suitable brake. Agreed I nearly bought this framest a couple of months ago and managed a test ride, it had shimano 6800 direct mount brake with dura ace c35s absolutey no braking issues. 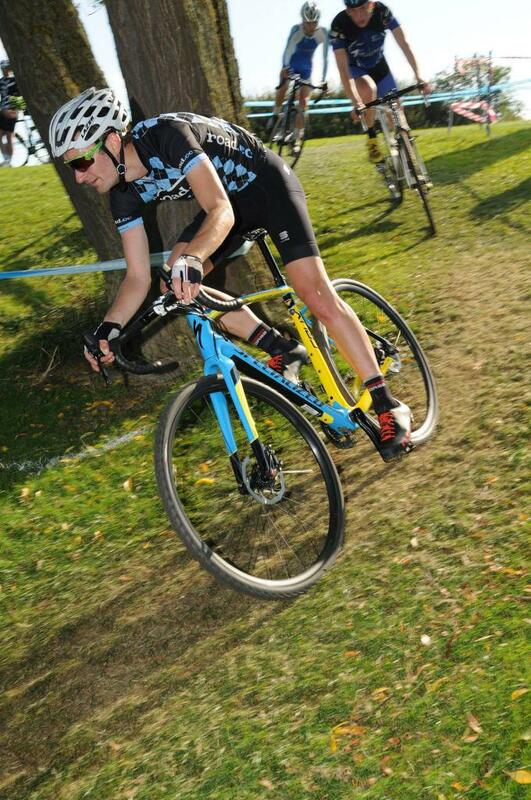 Opted for the CX zero frameset... Slightly more relaxed but goes like a rockets, and is exceedingly comfortable. You would think that they would wrap the bar tape properly. If you're referring to gap in the tape on the inside of the lever clamp... that's actually a traditional way of wrapping for racing. Why faff with an offcut or extra wrap when it serves no function. Simply years behind a company who invested in some tunnel time. 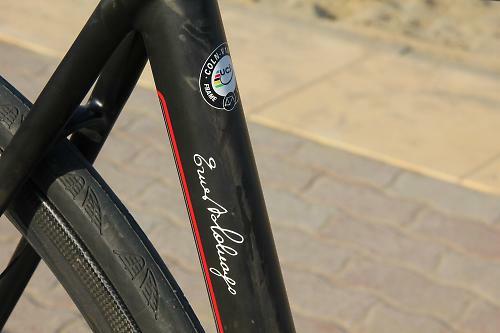 How they can call that BB profile and those seat stays aero- compared to the opposition is just from the marketing dept. Not the R and D. I witnessed a sheet being pulled off this at the eurobike launch and the level of underwhelmed crowd caused a shock wave that set off car alarms to berlin. Still the brand with a stunning shadow of history i want to retire on but aero! 4 of 20 things got a rating of 7..
does value override all else? What is it with Italian bike manufacturers and covering their bikes with loads of completely unnecessary graphics on their high end models? Every time I see a Bianchi, Willier or Colnago I wince at the number of gimicky marketing graphics and slogans that are printed all over the frame. 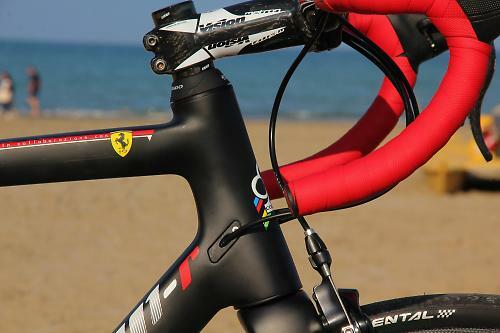 I was actually thinking this one wasn't too bad, until my eye met the pointless and garish Ferrari logo on the top tube. There's never any excuse for bad bar taping, and I've never heard your rationale before? I've taped hundreds of road bikes for racers and sportive customers, including my stint as workshop manager at Sigma Sport where we had many demanding customers with exact specifications. If I presented a custom build or production bike with bar tape in that condition it would be sent back to the workshop to be re-taped. Very important to get bar tape correct on a road bike; the customer may assume from poor bar taping form, that the mechanic has made shortcuts in other areas of their bike repair or custom build. When I did my Cytech II examination, that bar tape would be a "fail". I'm with hampstead_bandit on this (and I run my own bike shop too) - taping the bars well is a sign of attention to detail, and there's no reason to skimp on it. Race mechanics may well tape bars very fast, but that's because they've had years of practice and know just how to keep the tension even, which tapes work well with which amounts of overlap, which riders prefer the same thickness of tape across the whole bar, who prefers greater thickness on the tops, how to loop (or use the strip) around different kinds of levers, all that sort of thing. That sort of attention to detail is the mark of a good mechanic, and a rider is more likely to trust that mechanic to have paid attention to setting up the rest of the bike well. I'm often amazed at bike shows where manufacturers exhibit glowingly impressive framesets, with embarrassingly badly built kit. I've got a Trek Madone with Direct mount brakes, the bontrager brakes that came with it were awful. I swapped them out with some Ultegras and the braking performance is better than anything i've ever ridden (not that i've ridden a lot...) including my old bike with standard Ultegra brakes. 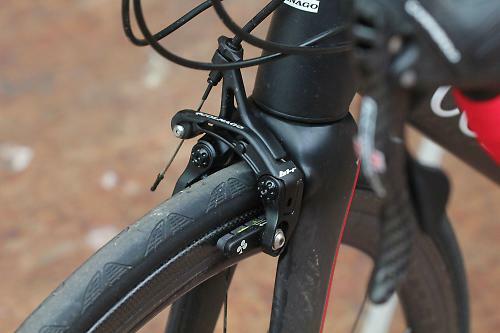 Didn't the review of the Dura Ace direct mount brakes get a very positive score? "...until my eye met the pointless and garish Ferrari logo on the top tube." Really? Garish Ferrari logo? Guessing you don't have a good grasp of the history of the Prancing Horse and Enzo's company. or the history of F1 and the most legendary car/racing company in the world. I mean, you appear extremely naive or just someone who doesn't seem to recognize any sport other than cycling. As in what? 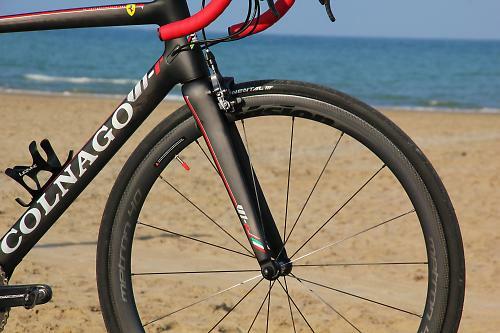 Ferrari must have paid Colnago to put their logo on the bike? They did help develop the aero design of the frame, using state of the art CAD/CAM tools and Ferrari's full-scale wind tunnel, but hey, any chump bike maker can do that! Right? But I suppose that doesn't warrant a logo of the most famed and storied Sportscar/Racing machine manufacture in history. Hey, to each his own, but at least come up with a better argument chief! Probably because it's used by dodgy amateurs like myself! I'm concerned with getting a durable, even wrap that feels good (and not much else). I don't like much padding around the lever so leave a gap at the clamp. I'm certainly not the only one - although you see it less these days. It's good to hear the view's of yourself and Pierre as you speak from professional experience. I agree the tape does look all over the place, maybe those flat-topped bars don't help. But look at the pictures again, it doesn't "look" like its aero so how can it be!! I've looked at pictures all my life, I'm an expert in aerodynamics just like everyone else here. There's a very good explanation about why this bike doesn't look as extreme as the "aero" frames mentioned above, here. Basically, a frame modelled on a baking sheet is only good if the wind is coming straight towards you, and that kind of limits where you'll be cycling if you only plan to go into a headwind. Surely the idea is that you're going so fast that you create your own headwind, if not bend light and the space-time continuum. Funny, in the picture, the wind direction is coming from both the front and the side. So what is the point here. What is it you're exactly trying to say, because so far, you have been vague and deflective. If you are saying that you disagree with some of the best aerodynamicists in the world, then just say it. Give Maranello a call, I'm sure they would love your input. Fascinating discussion about bar tape. If bar tape made me trust a mechanic or otherwise I'd be somewhat missing the point; bar tape being one of the least mechanical items on the bike. - that said I've never relied on (or trusted) bike mechanics to prep a bike (especially when racing) and when I've bought bikes I've always re taped the bars. But this is a review of a frame so bar tape isn't even relevant here. So after the disappointing performance of the TRP brakes, the Colnago went back and had the brakes swapped to new Colnago units, and they were much better, a big improvement. 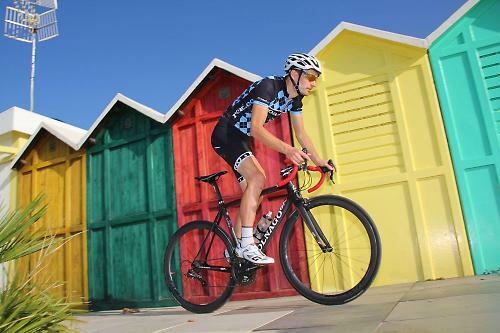 "Windwave, Colnago’s UK distributor, sell the frameset without brakes so it’s down to you to spec the brakes. There isn't a huge amount of choice at the moment, the bike was orginally supplied for review with TRP units. Their performance was lacklustre and disappointing, and took the shine of an otherwise stellar bike. "Hearing our complaints, Windwave took the bike away and replaced the brakes with Colnago’s own brakes, which weren’t available at the time of the test. The difference was massive. 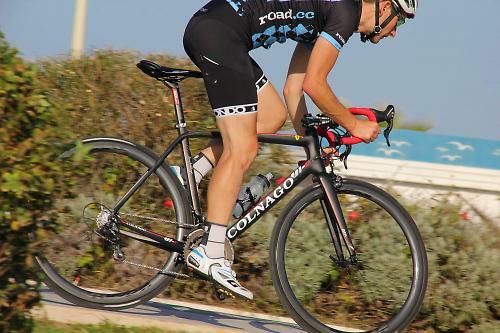 :Instead of the previously underpowered and inconsistent braking feel with the TRP brakes, the Colnago items were much more powerful, with a lever feel immeasurably better." So, if you're planning to buy a Colnago V1-r, choose the brakes you fit carefully. Leaving gaps is traditional? Really? In my 30 years of riding and wrenching, I guess wrapping the tape evenly, and leaving no gaps, has been all wrong. Or, people could learn the old "figure 8" trick, and not need to worry about the extra piece of tape for the clamp section, yet still have no gaps.